Snapshot: An exciting adventure reuniting most of the creative talent from the Justice League animated TV series that is almost derailed by major plot holes at the end. The story opens with Batman (Kevin Conroy), Superman (Tim Daly), Wonder Woman (Susan Eisenberg), Green Lantern (Nathan Fillion) Martian Manhunter (Carl Lumbly), and the Flash (Michael Rosenbaum) thwarting a jewel heist by a gang of thieves who seem to have a little more high-tech than expected. It turns out that they were supplied by the immortal Vandal Savage (Phil Morris) as part of his plot to destroy the Justice League and take over the world. It turns out Savage is focused on the big picture. Little things like Batman’s secret identity don’t interest him (and anyway, he already knows it). Savage uses his “Legion of Doom” to discover and carry out the Dark Knight’s “contingency plans” for stopping any rogue Justice League member. This leads to a second act filled with nonstop action and suspense as the Justice Leaguers are knocked off, one by one by their rivals: Bane (Carlos Alazraqui), Cheetah (Claudia Black), Metallo (Paul Blackthorne), Star Sapphire (Olivia d’Abo), Mirror Master (Alexis Denisof), and Ma’alefa’ak (Carl Lumbly). The third act is also filled with exciting action as the League regroups and fights to stave off Savage’s ultimate end game: the literal destruction of half the world’s population along with all technology utilizing electricity so that he can become the undisputed ruler of what’s left. Here’s where, for me, the plot goes off the rails. I realize that movies like this have to up the ante, especially with superheroes as powerful as the Justice League, but really, what kind of crazy does a super-villain have to be to think that ruling a decimated Earth would be any way fulfilling? And the way Savage plans to wreak this havoc is mind-boggling, even for a comic book story. OK, he demonstrated that he has super-advanced technology earlier in the story, so I can kind of give it a pass that he can launch a rocket from the Earth that will crash into the Sun causing massive solar flares that will destroy anything in their path. But come one, it’s the fracking Sun! There’s nothing manmade that could possibly cause the Sun to explode this way. If this were the only plot hole, I could forgive it. But the bigger plot hole is that the rocket takes only about a minute to reach the Sun. Even at the speed of light, it would take eight minutes, a fact that they repeat several times in relation to how long it will take the solar flares to reach Earth. A rocket would take months, if not years (it took the MESSENGER probe almost four years to arrive at Mercury) to reach the Sun. This could have been easily explained away in the movie if Savage had simply stated that he launched the rocket months ago in preparation. The climax could still have been as exciting, with the heroes attempting to activate the rocket’s fail-safe rather than attempting to cancel its launch. Nevertheless, Justice League: Doom is well worth seeing. The chemistry between the returning voice actors is fun, as the they have grown into their roles over the years. Bumper Robinson as Cyborg is a welcome addition to the ensemble, and I hope we get to see more of him in future installments. (This movie just reinforces my desire to see a resurrected Justice League TV series.) There are many nice character interactions between the heroes and their villainous counterparts, as well as some pointed humor between Batman and Alfred (“You’re dripping blood on my clean floor.”) There is also some wonderful poignancy in the second act when it looks like our heroes are done for, especially when Green Lantern thinks he’s killed a civilian and momentarily loses his nerve. 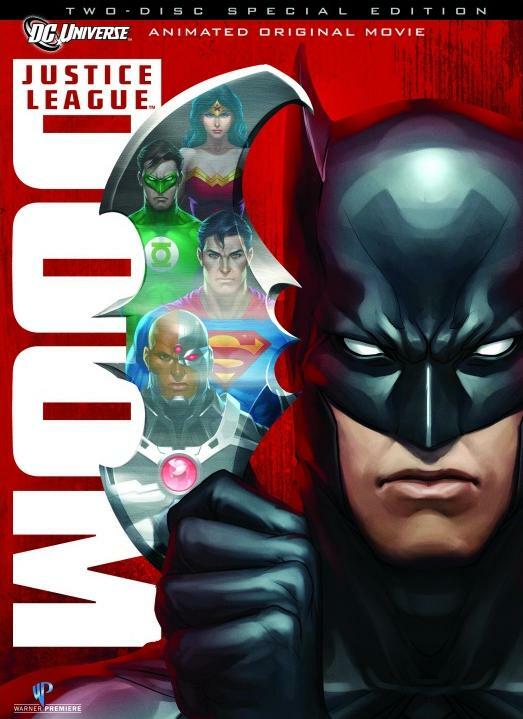 Justice League: Doom is an exciting yet bittersweet end to Dwayne McDuffie’s prolific career as a writer for the DC animated universe (he died unexpectedly a year ago). I wish that the live-action movies were even close to the quality of the animated movies. The “Justice League” group includes eleven of the major superhero titles. Today, I’ll look at two of them. 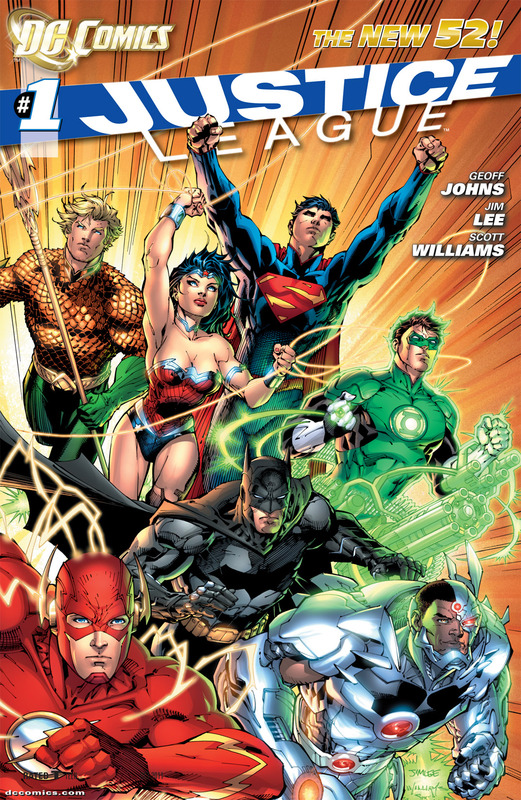 Justice League (notably, not Justice League of America) is the flagship title of the New 52. It was the first of the new #1s to be released, and DC’s two biggest powerhouses, Geoff Johns and Jim Lee, created it. The story begins five years before the events of the other DC books. It is a time when superheroes are just beginning to become widely known to the public, and not necessarily in a good way. It is clear, however, that at least some of the superheroes have been covertly operating for some unspecified, but significant, amount of time. From the promotional materials the Justice League lineup will ultimately include the DC heavy hitters: Batman, Superman, Wonder Woman, Green Lantern, Flash, Aquaman, and … Cyborg. Cyborg? Apparently, someone at DC felt that Cyborg’s popularity from the Teen Titans animated TV series, combined with his racial minority status, would be a good fit among these icons. Cyborg also played a major role in Flashpoint, as the only superhero to be trusted by the U.S. government. Justice League #1 begins with Batman chasing down what turns out to be a transforming alien that is wreaking havoc on Gotham City. Green Lantern Hal Jordan arrives to lend a hand, having been alerted to the crisis as an extraterrestrial threat. Batman is mistrustful of the arrogant Lantern, but eventually they combine forces to vanquish the monster as it screams, “For Darkseid!” Neither understands this cry; Green Lantern wonders, “Dark Side? What is that? A band?” Green Lantern seems to be ignorant about a lot of things. At one point he realizes that Batman is “just some guy in a bat costume.” The two decide to go see what Superman, the only known alien on Earth, knows about the attack. Batman is wary, however, stating that Superman is dangerous. When they get to Metropolis, though, Green Lantern completely ignores the evidence of a recent, titanic fight and attempts to restrain Superman. Superman knocks Green Lantern across the city; to be continued…. We also get four pages of pre-Cyborg Vic Stone as a high school football star. And watching him play? The mysterious hooded figure from Flashpoint (who makes a cameo in every issue of the New 52). Thus, we get some clues as to what the Hood was referring to in her cryptic message in Flashpoint #5. It appears that Darkseid will be the villain who will bring the superheroes together. Seems reasonable to me. What role the Hood will take remains to be seen, but I’ll bet she is more than just an observer. Johns and Lee have created a story and characters that are engaging and make me want to read more. It looks to be a perfect entryway into the new DC universe. This is a fitting start to the New 52. Green Arrow has gone through about as many concept changes as any superhero in DC’s stable. He began as a swashbuckling version of Batman, with trick arrows instead of a utility belt. Denny O’Neil and Neal Adams transformed him into a socially conscious do-gooder in the 1970s with the classic team-up with Green Lantern. In the 1980s Mike Grell took Green Arrow back to his roots, making him a sort of urban manhunter. 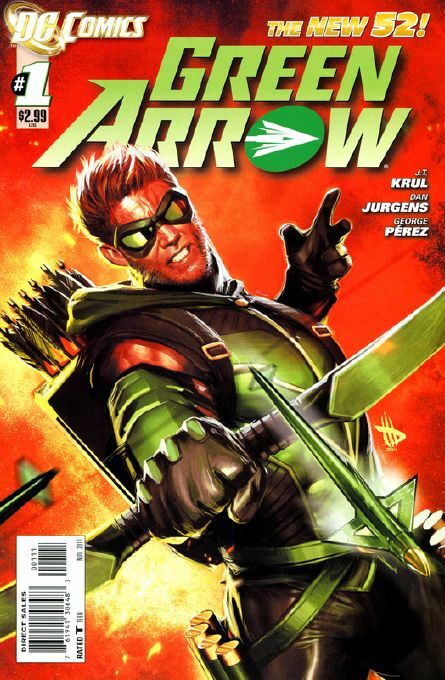 What will writer J. T. Krul and artists Dan Jurgens and George Pèrez do with Green Arrow? Based on the first issue, it’s basically back to Batman-lite: Oliver Queen, billionaire owner of a high-tech multi-industry company, uses key company resources and personnel to help him fight crime while simultaneously running the business via conference calling. As Green Arrow, he uses his trick arrows and superior martial arts to single-handedly bring down the bad guys. But he has a code to not use lethal force. He rationalizes his vigilante actions because, “I can’t sit on the sidelines and do nothing. I won’t. The last time I did, I watched people die.” It will be interesting to see this back-story unfold. I suspect that Green Arrow will eventually go from a young, idealistic crime fighter to the more cynical version of recent years. Green Arrow is not a title that will likely win any awards, but it’s a solid superhero story, with lots of action, some interesting super-villains, and a bit of character development. Nothing too daring, and accessible to a new reader. The artwork, by two dependable veterans, is well laid out and visually interesting.